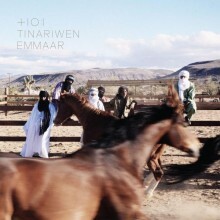 Tinariwen’s new album Emaar will be out on February 11th, and the band has released another new track and music video to prepare for the release. The video for “Imidiwan Ahi Sigdim” originally premiered on OkayAfrica.com and is now available to watch below via YouTube. The entire release was recorded in Joshua Tree, California due to unrest in the band’s home country. They will be touring throughout the U.S. beginning with performances at SXSW in March. Full details below. OkayAfrica.com is premiering a new song and video from the acclaimed North African Tuareg band Tinariwen. The powerfully hypnotic song “Imidiwan Ahi Sigdim” is from the band’s highly anticipated new album Emmaar which arrives in stores this February 11th. The appropriately hallucinatory clip features a striking montage of desert imagery over the song’s soulful guitar and vocal refrain. Tinariwen will bring their electrifying nomadic guitar sound to town’s across North America when they tour in support of Emmaar. Due to unrest in the band’s homeland, the album was recorded in Joshua Tree, California, a region known for spaced-out rock ‘n’roll and psychedelic cowboy folk. Along with the band, a group of American musicians appear including Red Hot Chili Peppers guitarist Josh Klinghoffer, Matt Sweeney from Chavez, Nashville fiddler Fats Kaplin, and poet Saul Williams. The record was mixed by Vance Powell (Jack White, The Dead Weather) and offers a richly layered sound solidified by atmospheric textures and gritty guitar-work.